Nice One Bedroom & Loft & 2 Bath Condominium in town near the Sierra Star Golf Course and the shuttle route to the Eagle Lodge Express Ski Lift Area in Mammoth Lakes. Sleeps up to 6. Second Story unit with 2 levels. The Master Bedroom has 1 King Bed and a Flat Screen TV and the Loft has 1 Queen and 2 Twin Beds and there is a Queen Sofa Sleeper in the Living Room and a Flat Screen TV. Free wifi available in unit. You walk up 1 flight of stairs (outside) to enter the unit and there are two levels...The first floor is the master bedroom, 1 full bathroom, kitchen, living room, dining room...the second floor is the loft which is open to the living room by a half wall and second bathroom. There are 2 outside parking spaces available. There is a game room with a billiard table, a ping pong table and a video game in the lobby of the Sunshine Village condos. In the summer you have access to BBQ areas throughout the complex and a Tennis Court near the swimming pool at Sunshine Village. Coin-operated laundry facilities located in the common area near the office. 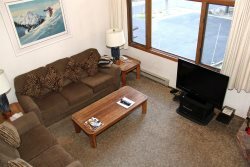 COMPLIMENTARY INTERNET and CABLE TV are provided, however NO REFUNDS will be given for connectivity problems or Internet failure. TOT LICENSE 3390-SV132. Great place to stay, very close to the resort to go skiing and snowboarding. Everything ran very smooth, thanks for letting us stay at your place. It was great. Great location and good place for a group. Wifi was fine but not great. Overall great experience, would stay here again. The location is excellent. And we had a great stay! Thank you. Exactly as described, excellent value. This place was great, location was fantastic, parking was easy, amenities were just what we needed. steps from the mammoth resort shuttle, walking distance to restaurants and Vons. I highly recommend this unit and it was perfect for a group of 5 or 6ppl. Everything about our stay was perfect. The condo slept all of us perfectly with only one of the guest on the pull out couch. The beds were comfy but I would suggest bringing your own pillow for the upstairs beds. I knew from photos and descriptions the upstairs would be a tiny loft but it worked great! We slept four adults in the loft. The upstairs bathroom was very handy. All appliances worked great. We were a minute walk to the closest green line shuttle which brought us quickly to eagle lodge. The village was a short drive away. Hello, I just wanted to let you know that our family had a wonderful time staying at the Condo. The kids loved the coziness and mountain feel, as did we. First time we played Jinga in ages, so having games available was appreciated! We will definitely be back to appreciate the beauty of the Mammoth area!